Voiced by Albert Brooks, Ellen DeGeneres, Willem Dafoe, Geoffrey Rush, Allison Janney and Alexander Gould. Directed and written by Andrew Stanton. Produced by Graham Walters. A Buena Vista release. Animated. Rated G. Running time: 101 min. Like the previous films by ’toon production powerhouse Pixar (“Toy Story” and its sequel, “A Bug’s Life” and “Monsters, Inc.”) “Finding Nemo” is fun for the whole family--colorful and entertaining for kids and witty enough to engage adults. But while those previous films were undeniable achievements in computer animation, “Finding Nemo” is perhaps the first time Pixar’s technique has produced results this artistically beautiful. In the film, Marlin (Albert Brooks) and his young son Nemo (Alexander Gould) are separated during a typical familial spat by a well-meaning scuba diver who captures Nemo and takes him to a fish tank at his dentist’s office overlooking the Sydney Harbor. 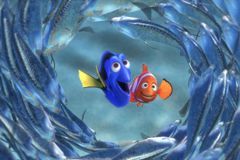 While Nemo attempts to escape with the help of some new friends, Marlin, a rather fearful and nebbish creature, nonetheless sets out to traverse the ocean in search of his son, picking up the friendly but very forgetful Dory (Ellen DeGeneres) along the way. It’s a lot of fun, and yet “Finding Nemo” is also socially responsible. One of Nemo’s fins is underformed, and while Dad has given his son a boost of confidence by dubbing it his “lucky fin,” he still frets that Nemo is not a very strong swimmer and thus unable to fend for himself--a key sticking point in their ill-fated argument. Separately, with the help of their respective new friends, Marlin realizes that he has to let his son go to experience the world, and Nemo learns that he can do anything he puts his mind to. But such details as plot, dialogue and theme ultimately are just the framework on which this beautiful tapestry is hung. The film opens in the Great Barrier Reef, characterized, as is much of the rest of the ocean, by a saturated color palette of blues, pinks, yellows, purples and greens. A forest of pale pink jellyfish is hauntingly beautiful. And when the fish surface, the water is pastel, reflective, as lovely or lovelier as anything that actually exists in nature.